I’ll admit it, I am a nerd, and even worse, I am a science nerd. I have always been interested in astronomy and have been wanting to give astrophotography a try for some time. I noticed the clear sky and decided to give it a try. I set up the big 400mm lens on a tripod and had a go. 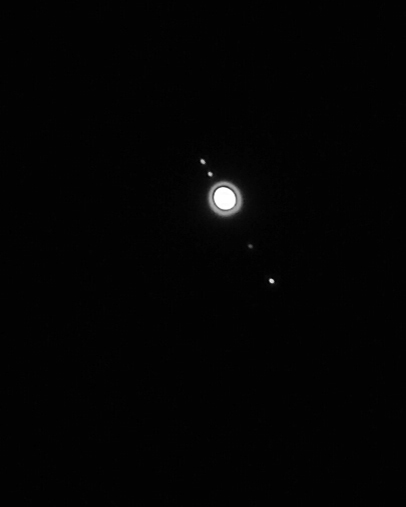 I was lucky enough to catch this shot of Jupiter with four of her moons. How cool is it to look from your planet and see not only another planet, but its moons as well. Pretty cool. 400mm lens, f5.6, 1 sec exposure, tripod mounted ISO 3200 Color removed in photoshop to correct for chromatic abberation. Posted In: astronomy, astrophotography, jupiter, moons, photography, planets, solar system, space, stars.